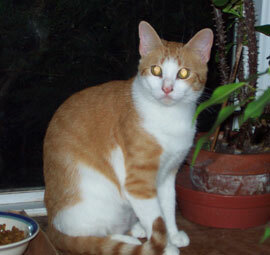 Freckle is one of our Fabulous Feral Success Stories. He came to us as an adult, very timid & unsociable. He kept to himself until he felt more comfortable & was more visible. When he began to tolerate human presence, he'd stay put & nap instead of getting up & hiding. I'd slowly reach over & he'd let me put my hand near him. Soon I could touch his feet, which caused him to squirm with horror & fascination. I never expected him to allow more contact beyond that but one day I just reached out & pet him on the head. He wasn't thrilled but he tentatively endured my hand, for just a moment. After that moment, a light must have gone off in Freckle's head. He realized that being petted feels good! From then on, he couldn't get enough, walking back & forth happily following my hand, when ever he could monopolize my attention. Freckle is now one step away from being Mr. Cuddles. He is so friendly & can't get enough luv. I often wake up with Freckle sitting on me, looking down at me, waiting for me to start petting him. He meows & reaches up for attention all the time. He's still not ready to be picked up but he's close. He just needed the chance to learn it's ok to be a softie!